You may be a Lulu Author, but are you a Google Author? If you’re reading this blog it’s likely you’re either already a published author or aspire to be one (and nobody can make that dream come true faster than Lulu!). But are you a Google Author? What is a Google Author? This is known as an “author rich snippet search result.” Google supplies a photo of the author of the content that the search result links to. In addition, this author usually gets a byline (which links to his or her Google profile), and a link to search results for more of that author’s content. What Are the Benefits of Google Authorship? Google has told us that there are at least three benefits content creators get from participating in this program. Two are already active, and the third is probably soon on its way. Rich Snippet Author Result – We’ve already looked at an example of this; it’s your author photo next to search results for your content, plus other custom links. Having a face photo next to a result has been shown to significantly increase the number of click-throughs the link will get. This is especially important if your result is not number 1. Click rates drop sharply as you go down the Google page, but people’s eyes are naturally drawn to a face. Ever wonder why so many Facebook ads have faces for their images? Copy Protection – The internet makes publishing your content easy, but unfortunately it makes it just as easy to plagiarize. Unscrupulous website owners may copy and republish your content without permission or attribution. That’s bad enough, but insult is added to injury if they manage to outrank you in Google for your own content! But if you have Google verified Authorship connected to your content, Google can tell who the original poster of the content is. I used to see copies of my online writing outrank my own sites all the time. Since implementing Google Authorship, I haven’t seen this happen once. Author Rank – This is the big one, but it (probably) isn’t implemented yet. Google has said that the real reason it wants writers to use Authorship is so that they can assess a search ranking factor called Author Rank. With Authorship, Google can watch how different people interact with your online content. If people comment on it, share it with others, retweet and +1 it, etc., Google can see that and it adds to your Author Rank. And if the right people engage with it (those who themselves have a trusted ranking for content similar to yours), the effect will be even greater. While Google has not indicated that Author Rank is “turned on” yet, they have said they are collecting data on Google Authors, so it pays to be using it now. 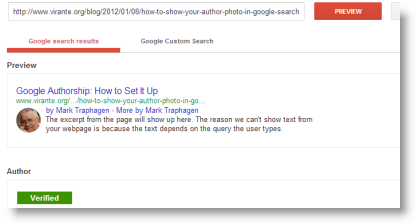 How Do You Get Google Authorship? It used to be a lot more complicated to verify your authorship with Google, but recently they have made it much easier. But the first and one essential step is you must have a Google+ profile. If you don’t have one but have a Google login (such as a Gmail address), just log in to your account and click the leftmost link in the black bar at the top of your browser. It will either say “+You” or “+[YourFirstName].” You will be guided through the process to “upgrade” to Google+. If you don’t have a Google account, go to Google.com and create one, and you will automatically have a Google+ account. a clear face photo as your profile picture. Once you have your G+ profile set up, the next step is to connect it to your content anywhere on the web. Verify by Link: In your content, link back to your Google+ profile. Go to your profile and copy the URL up to the end of the long number (your Google+ ID number). You can leave off “/about” or “/posts” at the end of the URL. Use this URL to create a link in your content. It’s usually easiest to do this in a short “about this author” paragraph at the beginning or end of your post. (See the end of this post for an example.) Usually this link is enough, but for extra “insurance,” add the rel=author tag to the link. This tag tells Google that this is a link intended to convey authorship linkage. The simplest way to do this is to append to the end of your profile URL a question mark plus the tag (so it would look something like this: https://plus.google.com/117313843837868070211?rel=author). Now skip down to “Link Back from Your Profile” below. Verify by Email: If you post your content primarily on a site for which you have a domain email address, you can use that to verify your authorship for that site. (A domain email has the same name after the @ sign as the site’s URL.) Go to your Google+ profile and click the Edit Profile button, then click on the Work email section. Add your domain email address. (If you don’t want this visible, you can change its visibility setting in this same edit box.) You will see a “verify” link appear next to the email address. Click it. Now go to that email account and find the verification email from Google, and follow it’s directions. That’s it! Just one more thing to do: on every piece of your content on that site, add a byline in the form “By Your Name” using the same exact name as on your G+ profile. Final Step – Link Back from Your Profile: Google uses a two-way linkage to verify your authorship of online content. Either of the steps above sets up the link from the onsite home of your content to your profile. Now you must link back from your profile. Go to your Google+ profile and click Edit Profile. Now scroll down and click on the Contributor To section. Add the URL of every site where you post content. This establishes the final confirmation to Google that the content is yours. (If you want more detailed instructions, or need to know how to hook up multiple authors on one site, see my post How to Show Your Author Photo in Google Search. If you want to be certain that the connection has been made correctly, Google has provided a tool to confirm this for you. Copy the URL of any page that has your content and copy it into the Structured Data Testing Tool (formerly the Rich Snippet Testing Tool). If you’ve established a proper connection, after clicking the Preview button you’ll see a green Verified notification under a simulation of your search result. So as a “real” author, why should you care about claiming Google Authorship? I think there are several very good reasons. Of course, I’m assuming that you create and share online content as part of your marketing plan for your books. Doing so gives potential readers a way of finding out about you, and provides a personal connection that helps keep your fans loyal and coming back for more. 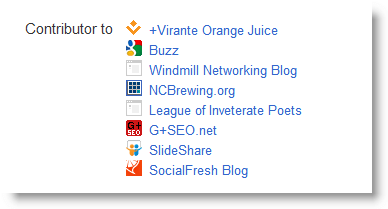 What does Google Authorship contribute to this? Seeing your face and name in search results when people search for topics you write about helps reinforce your personal branding, the most important asset an author has outside of the ability to write. The “More by…” link in the rich snippet search result opens a page of search results that are all your content. This can be a way for people to discover more things you’ve written. Most importantly, as Google begins to implement Author Rank, your content will begin to rank higher in search, which means it will be seen by more people. No one deserves to be a high ranking Google Author more than you, a real author! Mark Traphagen is Director of Social Media Marketing at Virante Inc., a search marketing agency in Morrisville, NC. Mark can be found on Twitter at @MarkTraphagen and on Google+ at +MarkTraphagen. Once again, on the subject of Google Authorship, Mr. Traphagen has shown himself to be the Jedi Master. 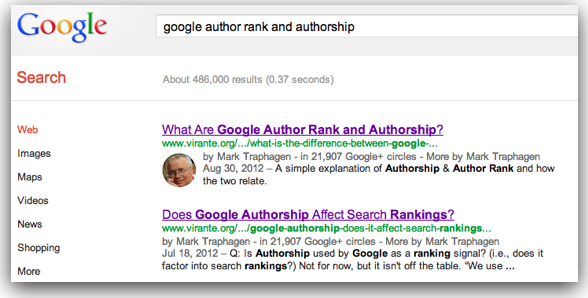 From now on please refer all questions about Google Authorship to Mr. Traphagen if you want the correct response. I’m sure he would love that 🙂 Thanks Mark, for setting me straight on the process of linking my authorship from http://planforlifesuccess.com to my Google Author Profile. Ah, but what if you are a nom de plume, such as I, the author of “rPlank : The Official Survival Guide by Captain Drew”? I felt overloaded. So, many steps and so many tasks that I am not sure I will be able to follow but I am going to try. Is it possible you could lay out the steps in a simply way? I know you have but I am visual and have a hard time following directions that are written out: A task that I am working on. I felt overloaded. So, many steps and so many tasks that I am not sure I will be able to follow but I am going to try. Is it possible you could lay out the steps in a simply way? I know you have but I am visual and have a hard time following directions that are written out:a task that I am working on. Check out at most book stores and they will order it. Excellent article that has been immensely helpful to me as a published author. A very nice article Mark, Google author rank is something which can bring a massive change in SEO industry. Author rank is going to be the most effective factor in 2013. Guest blogging and Google + sharing, they are very effective way to build author rank. Why not simplify this procedure to just setting a link connection as Facebook.com does with…”sign in with facebook account” to games and such online. Why can’t google and LULU work out similar for its’ authors? Plz email me reply! It’s also important to note that Bing is now showing authorship now, based on schema language. I have a few clients that are aspiring authors, I will pass this article on to them as I am sure they will find it both interesting and helpful.